Expand your lampworking skills by learning to make fancy, colorful glass canes. You will be introduced to a variety of cane pulling processes and techniques, focusing on even. consistent pulls. Demonstrations will include making encased stringer, striped cane, flat “ribbon” cane and more complex canes and the application of these canes. This workshop is for students at any level. This workshop is designed to strengthen your skills as a beadmaker and assist you in achieving your own unique graphic floral designs. 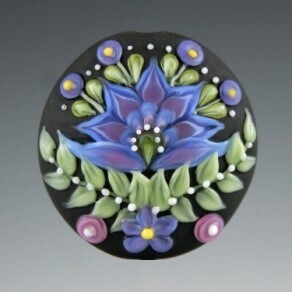 Techniques will include assembling canes, color mixing and overlays, and perfecting a variety of bead shapes. We’ll also focus on heat control, and controlled application and manipulation of stringers and dots. This workshop is intermediate level.